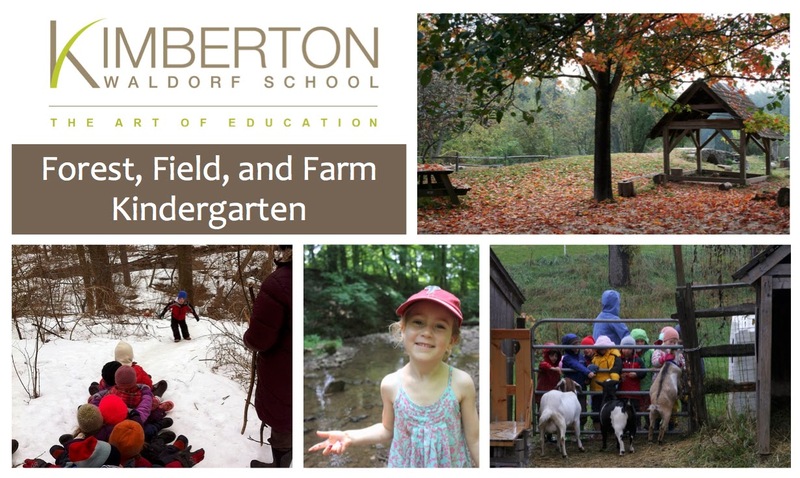 Kimberton Waldorf School, the second-oldest Waldorf school in North America, serving approximately 300 students from early childhood through grade twelve, is pleased to announce an outdoor, nature-based kindergarten program beginning in the 2015-2016 academic year. In the new Forest, Field, and Farm Kindergarten, the “classroom" is the school’s breathtaking 430-acre campus, with its rolling hills, farm and gardens, conservation trail, bubbling creeks, and wooded areas. Held outdoors, this program encourages children to play, explore, and immerse themselves in the natural environment — giving them the opportunity to use their imaginations, develop critical thinking skills, stretch their muscles, and hone their motor skills. The curriculum grows out of the ever-changing environment. The children are busy working in the garden, observing animals, witnessing changes in the land, crafting, and playing in nature’s playground. These kinds of activities develop a deep sense of wonder about the natural world and lay the foundation for scientific inquiry. Sticks, acorns, leaves, and other treasures become props for imaginative play and implements for counting, sorting, and pattern-recognition. Storytelling, songs, and poems provide a rich, language-based experience. Each day, children connect with the Earth, themselves, and others through exploration of animal habitats, nature crafts and handwork projects, water and sand play, farm chores, hiking, swinging, running, and more! Enrollment for the Forest, Field, and Farm Kindergarten is limited. Children ages 4-6 may be eligible to attend this half-day kindergarten program. For more information, or to request application materials, please visit www.kimberton.org/forestkindergarten, call 610.933.3635 ext. 108 or email admissions@kimberton.org. Kimberton Waldorf School, founded in 1941 by Alarik Myrin and Mabel Pew Myrin, is the second-oldest Waldorf School in North America. Waldorf Education offers a truly experiential approach to schooling. We serve approximately 300 children from preschool through grade twelve, as well as offer nature-based camp programs during the summer months. We seek to inspire a lifelong love of learning in all students and to enable each to fully develop his or her unique capacities. With over 1,000 Waldorf schools worldwide and more than 250 in the United States alone, Kimberton Waldorf School is part of one of the largest and fastest-growing independent school movements in the world. To find out more, please visit www.kimberton.org.